FRIDAY, Aug. 22, 2014 (HealthDay News) -- Inner city children have a higher-than-normal risk of developing food allergies, a new study finds. Researchers followed 516 inner city children in four U.S. cities -- Baltimore, Boston, New York and St. Louis -- from birth until age 5 and found that at least 10 percent of them developed an allergy to milk, eggs or peanuts. Because only the three most common types of food allergies were included in the study, the actual number of inner city youngsters with food allergies may be even higher, the researchers said. Overall, 6 percent of young children and nearly 3 percent of adults in the United States have at least one food allergy, according to the U.S. National Institutes of Health. Previous research found that inner city children also have a higher risk of asthma and environmental allergies, noted the authors of the study published online Aug. 13 in the Journal of Allergy and Clinical Immunology. "Our findings are a wake-up call, signaling an urgent need to unravel the causes, contributors and mechanisms that drive the high prevalence of food allergies among an already vulnerable group known for its high risk of asthma and environmental allergies," study senior investigator Dr. Robert Wood, director of pediatric allergy and immunology at Johns Hopkins Children's Center, said in a Hopkins news release. The most common food allergy among children in the study was to peanuts (6 percent), followed by eggs (4.3 percent) and milk (2.7 percent). Along with the 10 percent of children confirmed to have food allergies, 17 percent had possible food allergies and 29 percent were "sensitive but tolerant" to certain foods. Breast-fed children appeared to be at higher risk for food allergies, while those who lived in homes with higher levels of endotoxin -- a molecule released by certain types of bacteria -- had a lower risk. 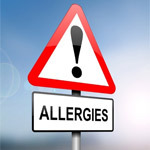 The researchers said the link between endotoxin exposure and lower risk of food allergies support the so-called hygiene hypothesis, which suggests that exposure to certain microbes early in life helps protect children against asthma and allergies. The study also found that children with food allergies were more likely to suffer from environmental allergies, wheezing and the allergic skin condition eczema.